Trading Options in Turbulent Markets, Second Edition skillfully explains the intricacies of options volatility and shows you how to use options to cope, and profit from, market turbulence. Throughout this new edition, options expert Larry Shover reveals how to use historical volatility to predict future volatility for a security and addresses how you can utilize that knowledge to make better trading decisions. Along the way, he also defines the so-called Greeks—delta, vega, theta, and gamma—and explains what drives their values and their relationship to historic and implied volatility. Shover then provides effective strategies for trading options contracts in uncertain times, addressing the decision-making process and how to trade objectively in the face of unpredictable and irrational market moves. Answers complex questions such as: How does a trader know when to tolerate risk and How does a successful trader respond to adversity? 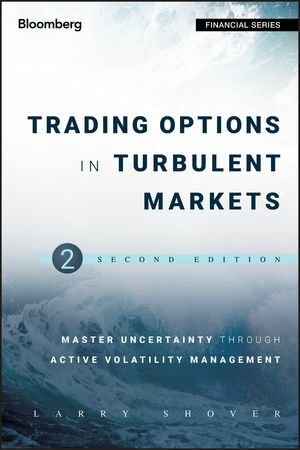 As volatility becomes a greater focus of traders and investors, Trading Options in Turbulent Markets, Second Edition will become an important resource for in-depth insights, practical advice, and profitable strategies. LARRY SHOVER has been a firm and proprietary options trader for more than twenty-five years and can be seen on networks such as Bloomberg, BNN, CNBC, CNN, FOX Business, Phoenix Television, and SKY. He is currently Chief Investment Officer and Portfolio Manager to Solutions Funds Group, Inc., a managed futures mutual fund. A large portion of his career has been dedicated to developing his own proprietary trading firm, and he has also served as director of education and senior vice president of trading at several commodities and options firms. Shover was a member of the CME and the Chicago Board Options Exchange (CBOE) and holds several Financial Industry Regulatory Authority (FINRA) licenses. He is also the author of the first edition of this title, published by Wiley.